Dark Horse Comics is celebrating the work of cartoonist Evan Dorkin this year, a six-time Eisner Award winner who is as skilled at creating humor comics as he is at writing heartbreaking tragedies. 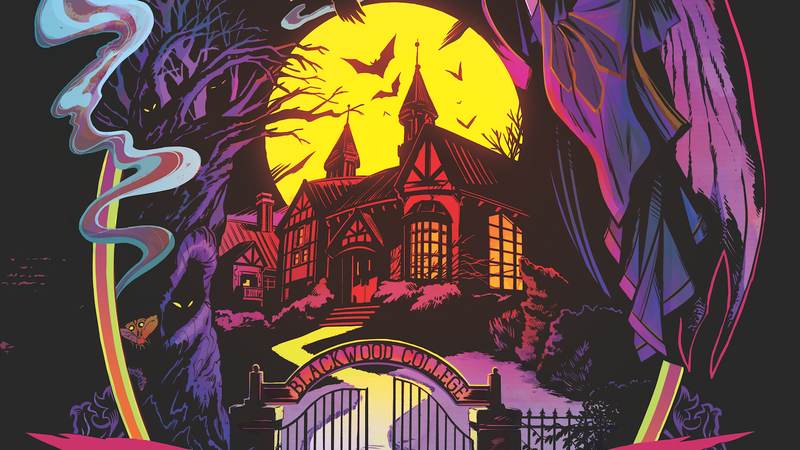 Dark Horse is publishing collections of Dorkin’s Milk And Cheese and Dork comics in May and July, respectively, but Dorkin is also creating something new with Blackwood, a four-issue miniseries teaming him with artists Veronica and Andy Fish for a college horror-comedy. The story follows four haunted young adults who attend Blackwood College to explore and improve their supernatural powers, but as is usually the case with these situations, there’s something ancient and sinister that interrupts their education. Evan and his wife/occasional co-writer Sarah Dyer met fellow husband-and-wife creators Andy and Veronica Fish at Heroes Con a few years ago while looking for artists for their digital comic Calla Cthulhu, which Dark Horse published in print last year. “I was also developing Blackwood, and when I saw Veronica’s work at her table it just clicked for me,” says Dorkin. “She had these really lovely and moody black and white pages from her creator-owned work, and a bunch of creepy Frankenstein images. Her pages showed some action, her art was strong on character and acting, and she didn’t skimp on backgrounds or storytelling. Seemed perfect for what I hoped for on Blackwood. I think what Veronica and Andy are doing on the book looks terrific, I’m excited to see it finally all come together. The A.V. Club has an exclusive first look at the unfinished covers for the first three issues of Blackwood, which debuts on May 30. The main covers by Veronica Fish blend ornate design with vibrant colors and spooky imagery, and the variants feature some of the best horror artists in the game: Becky Cloonan, Declan Shalvey & Jordie Bellaire, and Tyler Crook. Fish’s past work promises that the interiors will look as good as the covers, and the pairing of her skills with Dorkin’s deep storytelling makes Blackwood a can’t-miss new series.